This place is fast and professional. They gave me all of my options. This is also the first place that didn’tpressure me into buying stuff I didn’t need. I highly recommend. This place is fast and professional. They gave me all of my options. This is also the first place that didn’t pressure me into buying stuff I didn’t need. I highlyrecommend. Dr. Melamed was punctual, efficient, and very professional. Office staff was polite and office was very clean. Glad to havefound a new OD in LA. Dr. Melamed was punctual, efficient, and very professional. Office staff was polite and office was very clean. Glad to have found a new OD in LA. 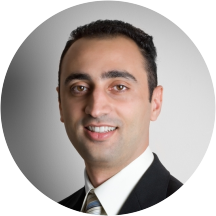 Dr. Fouad Melamed, is a native of Beverly Hills for over 20 years. He completed his undergraduate studies in Psychobiology at UCLA and earned his Doctorate of Optometry (California Board Certified) from the Southern California College of Optometry. Dr. Melamed completed his clinical externships at various Veterans Administration Medical Centers with his primary training being in the diagnosis and treatment of ocular disease with a focus on glaucoma, diabetes, and vascular disease. He is Board Certified in the treatment of Glaucoma (currently only a few Optometrists in California have this certification). He is an active member of the California Optometric Association and the American Optometric Association. Dr. Melamed resides in West Los Angeles with his wife and daughter. Dr. Melamed is fantastic. I would highly recommend him if you are in need of a eye doctor. Was great as a first visit! Very knowledgeable and honest! Great bedside manner. Would highly recommend. Friendly, laid back, provided great service. Front desk woman was really nice from the start. The Doctor was helpful and easy to talk with. He was extremely professional and kind. One of the best experiences I’ve had in a doctors office. Not condescending and very thorough. Didn’t rush me and seemed to truly care. Thank you! I was trying to find an eye doctor within my network and was glad I did just the basic eye exam. I was late by 10 min, but they accommodated me. Found out my eye issues based on Dr. Melamed's assessmentand if I follow his guidelines, I hope to not have to have glasses in the future. Doesn't check insurance before they take you in and lied about accepting it to patient just to get the business. Front desk is not very thorough or helpful. I will never come here again. Dr. Melamed was very helpful and patient with me when getting contacts fitted! He seems to be a very nice man and the receptionist was equally hospitable! first time visiting an optometrist and he and especially his assistant, Diana were outstanding and very helpful. I made the right choice! Dr. Melamed and his staff were friendly and efficient. I was in and out in less than 40 minutes and received excellent care. First time visiting and it was great! I have nothing to complain about regarding Dr. Melamed. That being said, I think that the woman who works at the front desk needs to do a better job at customer service. I prepaid for a 3-month supply of contact lenses.She said that they would be in within a couple of days. About 2 weeks later, I never heard from the office. I went there thinking that surely they would have arrived, and they still were not in. To make matters more frustrating, in the middle of our conversation, the phone rang and instead of putting the person on the phone on hold she kept me on hold. I have to say that I was really taken aback by the lack of communication from the office and then the poor customer service when I came by to find out what was going on. There are many optometrists in Los Angeles, and I have to say that due to this bad experience I am highly considering taking my business elsewhere. Dr Melamed put me at ease and answered all of my questions. Most comfortable I've ever been in an eye doctor's office. His staff was also very pleasant and knowledgable. My experience with Dr. Melamed and his staff was very good. They were professional, compassionate, and excellent communicators. I wholeheartedly recommend their services. Went in for a routine check up and renewed contact lens prescription. Searched all over Hollywood and ended up going with Dr. Melamed. He and his staff were very professional and did a fantastic job. I did not have to waitaround, pricing was fair and he was happy to address any questions or concerns I had about my eyes. Will definitely be back! I adore this office so much! Have been going there for years! Very friendly staff. Explained everything before proceeding. Highly recommended. Everyone in this office is absolutely wonderful, they make everything simple, answer any questions, and help with understanding insurance which is always confusing. The doctor Is great, friendly and knowledge. Been going here for years. Dr. Melamed was on-time and I was done within 30 minutes. Very professional and quick, highly recommended. Great experience - everyone was very engaged and awesome! Exactly what I look for in a doctor. He was very knowledgeable, appreciative of my time (I wasn't waiting forever) and answered all my questions. All in all I couldn't have asked for a better experience. Dr. Melamed was very knowledgeable and explained things in a way that was clear for someone not versed in eye health. The staff was very friendly and my visit was very quick and thorough. He seemed very knowledgeable about what I needed. He also made a professional decision based on a test that was not as routine. Dr. Melamed and his staff are very friendly and helpful. Figured out was going on and found the cure needed and improved on needed prescription. Friendly, efficient, and an excellent doctor. The experience was a breeze. Got my exam and he made some nice recommendations for new contact lenses and gave me samples to try them on. Highly recommend! Dr. Melamed and his entire staff are great. My dad is a retired optometrist and he was the only Dr. I ever went to see for all my eye care needs. After my dad retired I went to many different(five total)eye doctors and none of them came close to the treatment I received from my dad....Obviously. But, then I found Dr. Melamed and felt like I was right at home. My wife and two young kids also go to Dr. Melamed and they all love him. He even came in after hours to see my wife when she had a eye emergency and he and his staff always make my kids feel good about having their eyes examined. He has been my Dr. For more than 5 yrs. and is professional,, personable and knowledgeable. I am very satisfied and happy with his services. Friendly, helpful, timely and knowledgable. Great experience! I am so grateful to Dr. Melamed for being so carying and attentive. He always takes the time to address any concerns and questions I have about my eye care. He has the latest technology in his office Which garantees bestresults. He has been my Doctor for past 5 years and i am grateful for all his support. Thank you so much Dr. Melamed for taking such good care of my eyes. He simply is the best Gives you a through check up of the eye exam and Avery good Priscription for the lens . Great experience. Nice selection of frames to choose from. Office staff was very helpful! Since I prior to my apt taken the time to respond to ZocDoc for my info, when I arrived at the office - I was seen right away - no paper-work - and no wait time once in the exam room. The office staff was courteous and efficient.